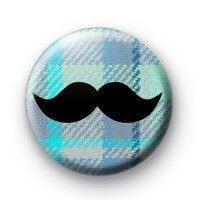 Cool Blue Pattern Movember Moustache badge in a plaid/tartan style. This 25mm badge is of a pale blue plaid design with a black moustache. These are great for Movember & can be used as prizes or to be auctioned off to raise awareness.